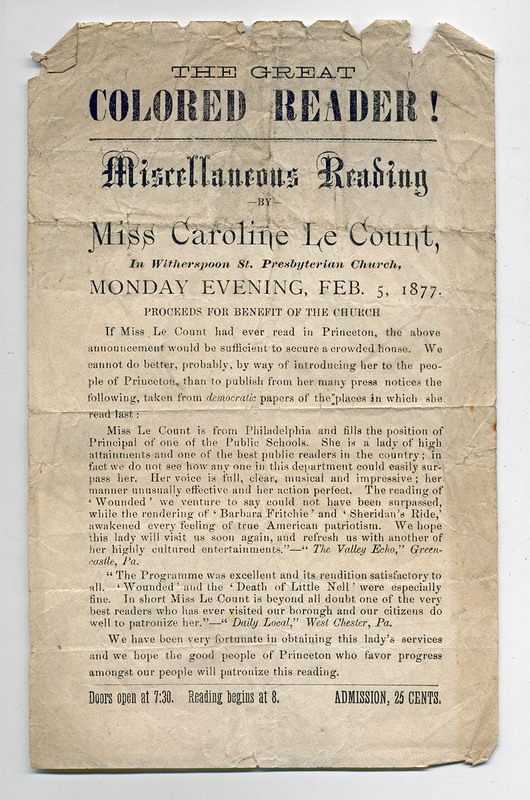 Caroline Le Count, though not so well known today, was a prominent African American activist and educator in Philadelphia in the 19th century. The Philadelphia Citizen recently referred to her as “Philly’s Rosa Parks” because she worked to dismantle streetcar segregation in the city, a goal accomplished in 1867 with a new Pennsylvania law. After the Civil War, many African Americans, especially women, began refusing to comply with the segregation of public transit in Philadelphia, knowing they’d often be handled roughly when conductors ejected them. Theirs was a movement of civil disobedience that pushed for expanded civil rights for African Americans and built on the momentum of the Union’s victory over the Confederacy. When a conductor did not comply with the new law three days after its passage and would not allow Le Count to ride, yelling a racial slur as he drove past without stopping, she reported it to a police officer. After Le Count showed the officer a copy of the law, he then arrested the conductor, who had to pay a $100 fine. The law mandated not only that African Americans must be permitted to ride streetcars, but that any distinction made on the basis of race on streetcars—in seating or service—was prohibited. After becoming the first black woman to pass the city’s teacher’s examination, Le Count began teaching at Philadelphia’s Ohio Street School in 1865. Later, sources say she became the second African American female to become principal of a public school, stepping in to serve in that post at Ohio Street School by 1868. She worked continuously to advocate for African American students, teachers, and principals. One newspaper editor said she was “a match for all the officers and members of the Board of Education combined.” After her fiancé, fellow activist Octavius V. Catto who had helped to draft the streetcar bill, was murdered on election day on October 10, 1871, the school was renamed in his honor. Le Count never married. Le Count was a noted author and speaker. Some sources mention her entertaining her audiences with a perfect imitation of an Irish accent. Often, she spoke or recited poetry at fundraisers for African American churches. The above notice, found in our Historical Subject Files (AC109), shows that she was raising money for the African American community in Princeton as well. Though we don’t know whether any students at Princeton would have attended her 1877 performance, it is plausible that some of Princeton’s African American staff would have. Unfortunately, we have found no further information about Le Count’s visit to Princeton. This entry was posted in Princeton University Archives and tagged Caroline Le Count, Civil Rights Movement, Philadelphia by April C. Armstrong. Bookmark the permalink.